About three days ago while driving down Papazian Street in the Arabkir district I noticed a lot of commotion beside the kiosks that are situated along the sidewalk near the intersection with Komitas Street. There were several police officers while other citizens seemed to have been irate and agitated. Yesterday there were red beret policemen on the scene. The kiosks came down upon a verbal decree by the Yerevan Mayor, Karen Karapetian. He gave the business owners a three-day warning. But, thanks to the power of the people, the government supposedly is putting a stop to further demolition. Apparently the authorities have been dumped with letters of protest, not to mention having been embarrassingly forced to deal with sit-ins. About the future plight of these shopkeepers, Karapetian has this to say: “I don’t think that there are poor people among the owners of kiosks on central streets, and the Mayor’s Office has no obligations to them … We are not obliged to give them an alternative [source of income] or compensation.” This statement alone demonstrates how utterly clueless and out of touch he is. He probably never walks down any city sidewalk, carted around in an outlandishly expensive European sedan or SUV, just like all the other selfish, abhorrent big shots. 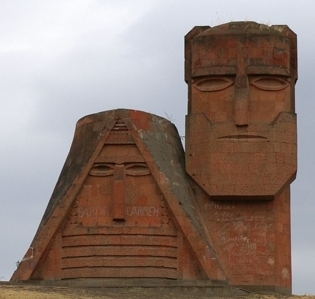 During a visit last weekend to the Nagorno-Karabakh Republic, commonly known as Artsakh to Armenians, some thoughts came to mind about the current state of affairs, the “no war, no peace” situation as it is sometimes referred to. It’s been 18 years since the cease fire, and Azerbaijanis have still to come to grips with the reality that Nagorno-Karabakh will most certainly never be part of the Republic of Azerbaijan. That the people of Artsakh will agree to hold a referendum as part of a peace deal to decide upon their status — when they had already determined it in 1991 by declaring independence — is an absurd expectation. The bonds between Armenia and Artsakh are tightly wound together; there is no separating the two without another senseless, brutal war. And despite Baku’s biweekly threats of renewed hostilities, that’s certainly something no one wants. In my view, it is not the OSCE’s Minsk Group that will force the two sides to sign a peace agreement. Indeed, if the three group member states really wanted to settle this matter once and for all an agreement would surely have been found in the last 15 years. These meetings being held, the discussions behind closed doors, and the subsequent statements issued are all part of an elaborate charade, a long-running theatrical production that is becoming more tiresome with every season. Ultimately, it is Russia that is going to decide when the deal has to be made and under what conditions, something that not too many people following the issue want to believe. A recent “extremely frank” meeting held between Russian President Dimitry Medvedev and Azerbaijan’s president Ilham Aliyev may lead the two sides closer to agreeing upon the principles of a peace deal, although given Baku’s stubborn, backtracking track record that seems unlikely. We have to keep waiting for an agreement in the meantime. The Armenians of Artsakh, on the other hand, made their decision in 1991. For them, there’s nothing, not one inch of land, to give. And they’re not even being asked to.